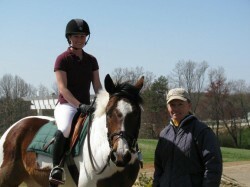 Elizabeth teaches all ages and levels of riders. The goal is a great partnership between horse and rider. Good skills, great communication between horse and rider, and practice are the keys. Elizabeth starts with the riders goals and any problems. All exercises come with the how and why for the rider and horse. Elizabeth helps riders build a systematic program of experience for young, green, or new dicipline horses. New riders to eventing will enjoy a similar program to build knowledge and confidence while addressing technical questions, cross country courses, and all the protocol of eventing. Safety is alway a great concern and we believe riding should still be fun. By appointment for private or small group lessons or half day/whole day clinics.